During my leisurely walk along the waterfront, I was surprised to see a ‘beach’. 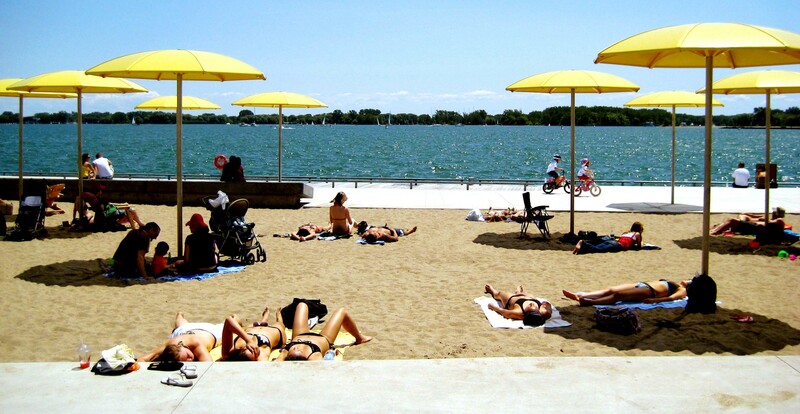 It is literally like a giant long sandbox along the water edge that is filled with sands and many tall yellow umbrellas. I then realised it is a new waterfront public space project that was opened June 2007. Well, it looks a little strange and awkward that a ‘beach’ that has no swimming and no waves. However, the good news is, you do have lots of sands, plus a lake view, with the umbrellas and chairs. As you can see, many people enjoy lying on the sands for a sunbath , or bringing their children for some sand games, or just simply walk along the ‘beach’ and enjoy the refreshing lake breezes. So, what’s the real difference and why not? And, it is equally a beautiful, lazy and leisurely summer afternoon. 卖茶去啰！Selling Tea ? Yup ! 115 queries in 0.291 seconds.